One of four childhood friends from Shioshishio. He has a short temper and usually scolds Manaka for her mistakes even though he has deep feelings for her. He is the son of Shioshishio's Chief Priest that serves the Sea God. At first, he hates all people from the surface, but after learning about the relationships between the land and sea humans (through Akari and Itaru), he gradually understands that there is no difference between the people from the surface and the sea. He went into hibernation shortly after saving Akari during the Ofunehiki festival. After the five-year timeskip, Hikari reappears during a Tomoebi without any signs of aging. 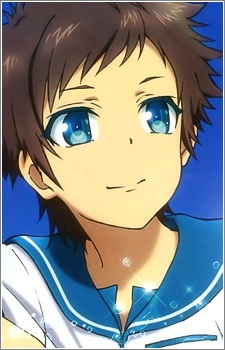 He rejoins Mihama Middle School as classmates with Miuna and Sayu and is living with his sister at Shiodome home. It was later revealed that Manaka had feelings for Hikari, but she decided to keep it a secret because she knew about Chisaki's feelings for Hikari.